By providing up to 70 in. (117.8 cm) of horizontal boom transfer, the Traverse T1258X telehandler allows operators to safely place loads at full lift height without needing to coordinate multiple boom functions. Marking its entry into the 12,000-lb. 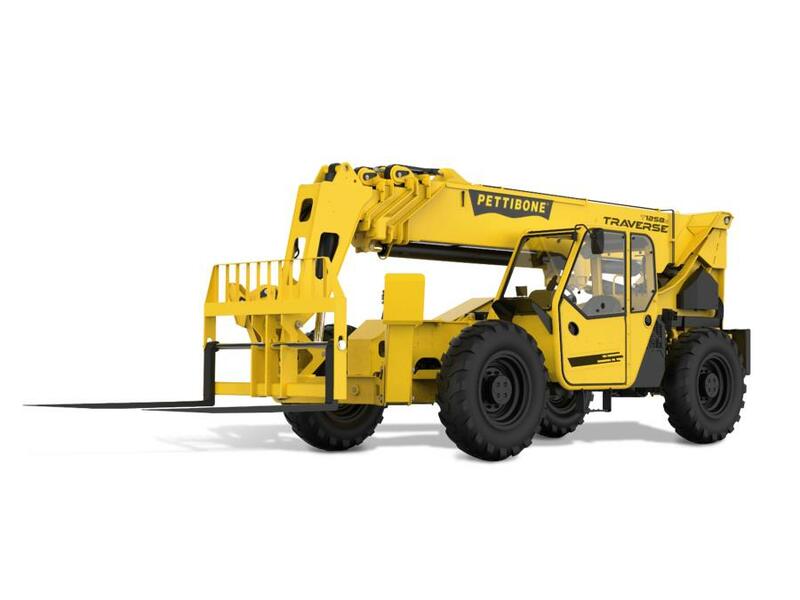 (5,443 kg) capacity market, Pettibone introduces the Traverse T1258X telehandler. The new Traverse model becomes part of the industry's only new telehandler product line with a traversing boom carriage that can move loads by traveling horizontally. By providing up to 70 in. (117.8 cm) of horizontal boom transfer, the Traverse allows operators to safely place loads at full lift height without needing to coordinate multiple boom functions. The T1258X has a specified lift height of 58 ft. 6 in. (17.8 m) and its landing height is identical. By contrast, traditional fixed boom pivots typically have a true landing height that is several feet less than the promoted lift height, as users must account for withdrawing the forks out of the load with enough rearward travel for the fork tips to clear the landing zone. The traversing boom allows for maximum forward reach of 47 ft. 10 in. (14.5 m). The new telehandler is powered by a 117-hp Cummins QSF 3.8 Tier IV Final diesel engine that helps the machine achieve its maximum load capacity of 12,000 lbs.. The engine is mounted on a side pod for easy service access while allowing excellent curbside visibility and ground clearance of 19 in. (48 cm). The T1258X is built on Pettibone's next gen X-Series platform, delivering a combination of rugged dependability, user-friendly controls and clear sightlines for enhanced visibility. Drivetrain and axles have been optimized to provide greater tractive effort with minimal tradeoff on top end speed. A pintle hitch mount adds versatility for towing. Built for use on rough terrain, the unit offers full-time 4-wheel-drive with limited-slip front axle differential. Tight steer angle capability provides an efficient turning radius of 14 ft. 4 in. (4.3 m). The Dana VDT12000 Powershift transmission offers three speeds, forward and reverse. Pettibone's hydraulics continue to deliver exceptional controllability and overall operating feel, while enhancing efficiency and cycle speeds, according to the manufacturer. Cylinder cushioning dampens the end of strokes — both extending and retracting — to avoid the wear-and-tear of hard, jarring stops, while also helping prevent the potential spilling of a load. The telehandler also uses a single lift cylinder that improves operator sight-lines, and has twin hydraulic lines for tilt and auxiliary plumbing. Featuring formed boom plates and less welding, the machine's 4-section boom offers greater strength while reducing weight. The design also minimizes boom deflection for better control and accuracy when placing loads. The operator cab maintains Pettibone's ergonomic seat, pedal, joystick and steering wheel positions. An analog/LCD gauge cluster comes standard. An optional 7-in. digital display with integrated back-up camera also is available. The cab also offers enhanced climate control, flat bolt-in glass, split door design, openable rear window, USB accessory plug, lockable storage under the seat and water-resistant components for easy interior washdown. All-steel fuel and hydraulic tanks are built to resist damage. The 30-gal. fuel tank offers ample volume for a full day's work at 100-percent load, and the lockable fuel-fill is in a clean, accessible location. Other features include non-tensioned boom hoses, split-system electrical circuit panels, a 12-volt accessory plug in the engine bay and heavy-duty bright LED lighting. Additional options include a sling hook for additional load security, solid or foam-filled tires, and a wide variety of attachments, including a 10-ft. (3 m) tower that can extend the machine's lift height beyond 68 ft. (20.7 m).